Cold winter weather doesn’t just wreak havoc on your home heating bills, but it can also take its toll on many home parts and appliances as well. One of them may very well be your garage door. Yes, while it’s natural for homeowners to take garage door operation for granted, it’s possible to dismiss how valuable such an appliance is until it’s stopped working. And in the cold weather, there are a variety of things that can go wrong with it. This post will take a look at some of the common cold weather garage door problems. Metal contracts in cold weather. And being that garage door tracks are typically made of metal, the door might become locked into place with the inability to move as it should. Try to avoid this issue by warming the garage during extreme cold spells, or having your tracks adjusted properly. Busted springs are one of the most common issues when it comes to garage door problems, but metal tends to become harder and more breakable during periods of cold weather. Hence, if your springs are older, the winter weather might do them in for good. It is possible to replace springs yourself, but it’s a complicated DIY project that can also pose a safety threat. For this reason, spring repair and replacement are best left to the pros. If your garage door won’t open, chances are your springs are busted. But in cold weather, you may face another issue preventing the door from opening – a frozen threshold. This often occurs when precipitation gets onto the garage door’s weather stripping and then freezes. The good news is that it’s an easy fix. Pour warm water on the frozen area until it is no longer frozen. A few remote issues may arise in the cold weather months. One, you may need to change the battery in it, which isn’t necessarily a cold weather issue, but something important to note regardless. Secondly, moisture may develop on the battery contacts, which you’ll need to clean up before the remote can properly work again. This is most common in cold weather environments when the remote is clipped to a vehicle’s visor. As is the case with most mechanical appliances, preventative maintenance, and ongoing maintenance is key to a well-working garage door in the winter. For more information or to troubleshoot your malfunctioning garage door, contact us today. 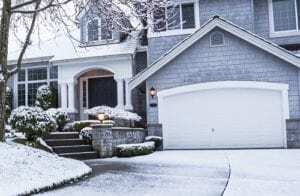 My Garage Door won’t Close when it’s Cold – What do I Do? How Much does it Cost to Repair a Garage Door? What’s the Difference Between Chain Drive vs Belt Drive?